HMC’s Sleep Center, located in our Sugar Land office, features state-of-the-art computer technology and individual bedrooms designed to resemble a bedroom or hotel room. Under supervision of our board-certified pulmonologist who specializes in sleep disorders, a polysomnographic technologist provides around-the-clock supervision and monitoring of all patients. Sleep disorders generally cause difficulty falling asleep, staying asleep, or difficulty maintaining alertness during the day. Common sleep disorders include Obstructive Sleep Apnea (OSA), Restless Legs Syndrome, Periodic Limb Movement Disorder, Attention Deficit Hyperactivity Disorder, Narcolepsy, and Insomnia. Sleep study is a painless and non-invasive procedure. The sensors do not cause any discomfort or restrict movement during the procedure. A Technologist remains in the adjoining observation room throughout the testings process and will wake you in the morning. Most testing is performed during the night but some testings are done during the day according to the patient’s symptoms and needs. Upon completion of your sleep study at HMC’s sleep center, a sleep disorders specialist will provide your referring physician a final report with a diagnosis and treatment recommendations that may vary from simple lifestyle changes to medications. Because each individual is different, evaluations and treatment plans are structured on a case-by-case basis. 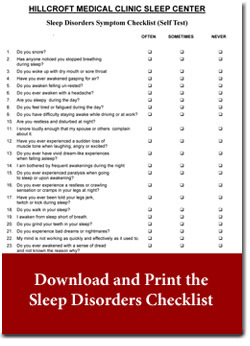 A physician’s order is required to qualify for a sleep study. To schedule a sleep study at the MHC Sleep Center at our Sugar Land clinic or for more information about sleep studies or sleep disorders, call (713) 273-5838.